Rafael Maximo Castillo is a sophomore in his first year of journalism. He is a type of person who enjoys the outdoors; last summer, he went to a couple of different outdoor camps. He went to Koinonia Water Sports Camp where he had the opportunity to go wakeboarding. Rafael also went to two other junior camps where he worked and helped out. The camp is located at Lake Don Pedro. At the two camps, Rafael helped co-lead a cabin of twelve kids and was an assistant to the director of the camp. An ideal vacation spot for Rafael is Yellowstone National Park because he would like to see the beautiful wildlife that is there since he likes to spend his time outdoors in the woods. If Rafael was given a thousand dollars, he would donate all of the money to the summer camps that he worked for so they could buy better supplies. 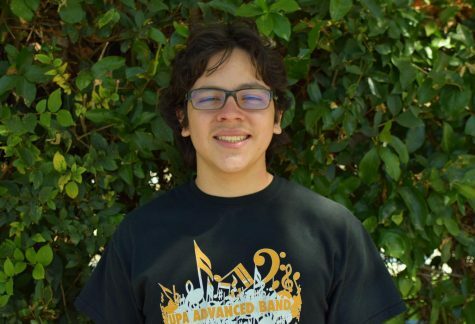 An interesting hobby Rafael has is archery, and he also plays a video game called “Heroes of the Storm.” His favorite quote is: “A moment of pain is worth a lifetime of glory” by Pete Zamperini because it is motivating and signifies that bad times come, but they lead to good times. In the future, Rafael would like to go to Santa Clara University to get a business management degree.